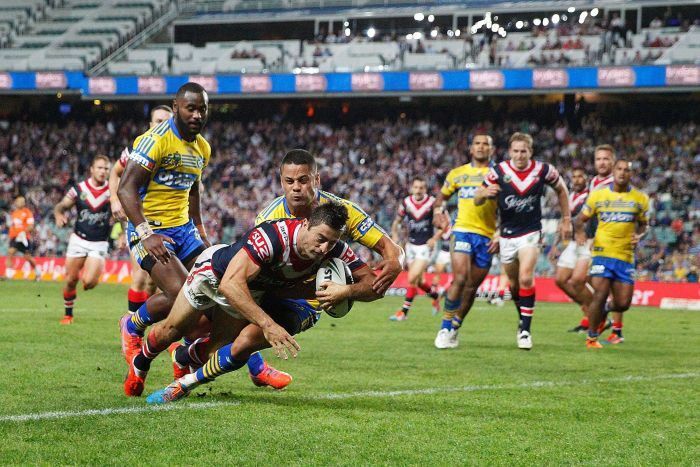 REVIEW: Roosters 56, Eels 4. History repeating? We’ll take the extra two. SYDNEY ROOSTERS 56 (A Minichiello 3, R Tuivasa-Sheck 2, M Aubusson 2, D Tupou, S Moa, B Cordner tries; Maloney 8 goals) bt PARRAMATTA EELS 4 (S Radradra try). Crowd: 13,269 at Allianz Stadium. If we are just going to add two points to every scoreline from last year, then we should just go ahead and declare the Roosters the 2014 premiers by 10 points over the Sea Eagles. Because history is seemingly repeating itself with a slight rewriting based on the first two rounds. The Rabbitohs beat us by 18 in 2013, and 20 this year. The Roosters pumped the Eels by 50 last year, then topped that with a 52 point victory on Saturday night, on a sloppy pitch to boot. What price is a 10 point win over the Broncos this week? After the disappointment of round one, when the Roosters failed to make a line break and were as limp as a coked-up Dirk Diggler, no-one really saw a game against a seemingly rejuvenated Eels squad as an easy two points — especially after the Eels flogged the Warriors a week earlier. And after the Roosters piled on the first 16 points with relative ease, the Eels tried a few things in the second 20 minutes. A beautiful early-tackle grubber to Semi Radradra, some probing darts from Jarryd Hayne and another near try off a kick towards the end had many fans thinking there might be a game on our hands. But then the Roosters returned to their form from last year and shredded the Eels like a cooked book on Wall Street, scoring seven tries in the second half to send the Eels back to wooden spoon contention, where they seem so comfortable. Here’s their second half, in stats (per NRL Stats): A point a minute was secured with three to go; they almost racked up a kilometre in running metres (926 off 89 runs); four try assists and seven tries; 10 line breaks and six line break assists; and possession was 63 to 37 in their favour. But they played expansive, exploratory football, which clearly wasnt the case last week. To wit, they had just three dummy half runs all game compared to the Eels’ 16. Again, the Roosters bucked a trend and reaped the rewards. Was it Anthony Minichiello who dusted off the rust from last week and perhaps had his best game in four years with his first ever hat trick, three line breaks, three tackle busts, 173 metres run and superb support play? Was it Jared Waerea-Hargreaves, who set the defensive tone to go with a try assist and 135 metres with 23 tackles, as well as a dash of whiplash? Was it Roger Tuivasa-Sheck, with his two tries and beautiful work as a new-age fullback on the fringes, including a try that was downright breathtaking? Or was it Mitch Aubusson with his two tries, three line breaks, eight tackle busts, staunch defence and a try assist? Well, in masterpieces you just have to give the man of the match to the conductor, the director, the artist. And in this writer’s mind, the Picasso for the game was Mitchell Pearce. He peppered Vai Toutai all game with bombs, and the winger looked pressured because of it. He combined brilliantly on both fringes with Boyd Cordner and especially Aubusson, and just took the game by the neck in the second half. He finished with two try assists, a line break asssist, and 293 metres from just eight kicks. He also broke the line and made 51 metres off four runs. But it was his confidence and activity in the second half that really steered a ship that was moored last week, and that direction resulted in the club’s biggest ever win over the strugglers from out west. Shaun Kenny-Dowall — his best game since 2010. I said at the start of the year if SKD’s attack can return to anywhere near its best, then he’s a shoo-in for a new contract. And while his defence lapsed a bit (albeit still much better than 2011-12) his attack, at last, is back to where it once was. He’s running straight and tucking the ball in, and just using that incredible leg drive and bump-off upper body strength to incredible effect this season, and while his days of scoring 20 tries in a season may be over (with the way the attack for the Roosters is structured) he’s arguably far more effective than he was when he was named Dally M Centre of the Year a little over three years ago. He led the NRL in errors last year with 32, but in 2014 he hasn’t made a single one — one of just four Roosters (with Aidan Guerra, Kane Evans and Jake Friend) who claim claim that. But it’s the metres he’s making and the directness of his runs which has him back as an effective and potentially dangerous centre. Against the Eels he led the club in runs, with 17, and was second in metres with 147. He busted four tackles and had an offload and two try-and-line-break assists. This year he’s averaging 14.5 runs and 119.5 metres. His effectiveness, in short, is back, as his his confidence. When Sonny Bill departs at the end of the year, they will need an x-factor out on the right edge. It’s SBW dominant at the moment, and rightly so — but it means SKD often has to take a back seat. You can see what Skiddzy is capable of though when he’s the main target out there, and he’s playing his way into serious form with every direct run. If that was Jared Waerea-Hargreaves, episode 1. Seriously? This isn’t a send-off? JWH was sent off last year for a high shot on George Rose, yet at least his hit the ball first and drifted up. Lussick? He had his left arm extended for five metres like he was indicating a left turn on a bicycle. But because Darcy Lussick was blessed with a different name he stayed on, and then went in AGAIN high. It seems the referees only have the courage to send off a guy with a big name and a reputation to match, rather than a fringe starter for the struggling dual wooden spooners. If JWH is sent off at any point this year, we will erupt — and rightly so. We ask for consistency, but it’s more than that: every decision like this smacks of hypocrisy. There’s been talk all week about protecting our players, yet we let a blatant coat-hanger go? Mini back to form — and why the fullback “arrangement” is working for now. After a dodgy World Club Challenge and an ineffective kick-return game against the Bunnies from The Count, many were again calling for RTS to move permanently to fullback. Some were even asking for more drastic measures. But the time-share arrangement the two have was incredibly effective against the Eels. They’d swap positions on every other play and kept the defence guessing every time. Mini scored one try while on the wing and two in support at fullback, and RTS split his tries in each position. I watched the switch closely from Bay 31 in the second half, and they barely even call out the change — if one is gassed, they switch spots, and switch back once the other gets a bit of work in. It means you now have to contend with RTS’s speed and footwork across the park and out all the way to the wing — it’s impossible to plan for because he’s such a different threat in each spot. He showed some ball skills up in the line, and when that is combined with his footwork you can see why he’s the next great fullback. Meanwhile, Mini showed he can still finish plays out on the wing: his effort for his second try showed that he still knows how to stay deep and react to one-on-one plays, but at fullback he also showed some support play we haven’t seen in a while. He’s always there or thereabouts, but he rarely makes a clean break off his support. There are worse things at the moment than having these guys split time at the back as RTS becomes accustomed to the nuances of fullback play. Kane Evans proved he’s a first grader. It’s not as if there was any real doubt, but after two years of hype you wondered whether his game would translate to the quicker and more brutal NRL stage. And while the Eels are hardly a litmus test for forwards, you have to start somewhere, and Kane started his NRL career extremely well. In 29 minutes he had 10 runs and 103 metres, with three tackle breaks and 13 tackles. By any measure, that’s a fantastic workrate. But the quality of those runs was huge in the second half, when the Roosters dominated field position. One run in particular had the defence skittled and both he and Dylan Napa provided the platform when JWH and Sam Moa were off. It’s something the Roosters lacked last week, but given both players’ performances off the bench (Napa had 12 runs for 106 metres), it may be hard to keep them out of the squad — even with Remi Casty itching for a start. The Roosters will again be without Sonny Bill Williams, but in the four games he has missed for the club over the past two years they’ve hardly skipped a beat in racking up four wins by a combined scoreline of 160 – 32. I’d clearly rather have in in the team than not, and those four wins have been against veritable easy beats — the Panthers, a depleted Sharks and the rabble that was the Raiders last year, and the Eels this year. But not having him there has led to other players filling the breach with what looks like ease, and the ball has been used more across the park. There is sometimes an over-reliance on SBW to dig them out of a hole. But it’s games like this that make you realise once again that, while superstars are important, it’s a team game. And when the team clicks, as it did on Saturday night, the results can be devastating. ← The curse of hype: are we burdening Kane Evans with unfair expectation? The silence is deafening on the charge to be levelled against Lussick, yet it’s interesting the NRL thinks it’s ok to post up an article outlining JWH & Lussicks friendship, as well as JWH’s initial response to the hit. No official comment on whether Badger acted properly in not sending Lussick straight off. No support for Badger forthcoming either for that matter. Is it a public holiday in Moore Park? Is Labour Day in effect? Who knows, but hopefully they arent trying to soften the masses for a forthcoming lenient charge. I think they’ll charge him appropriately though given the two days of backpage news.